The Campbell was originally bred in 1901 by Mrs Campbell of Uley, Gloucestershire, England. 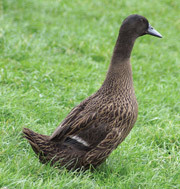 It was bred from the wild Mallard together with Fawn and White Runners and the Rouen. The dark Campbell was created by Mr HRS Humphreys in Devon.